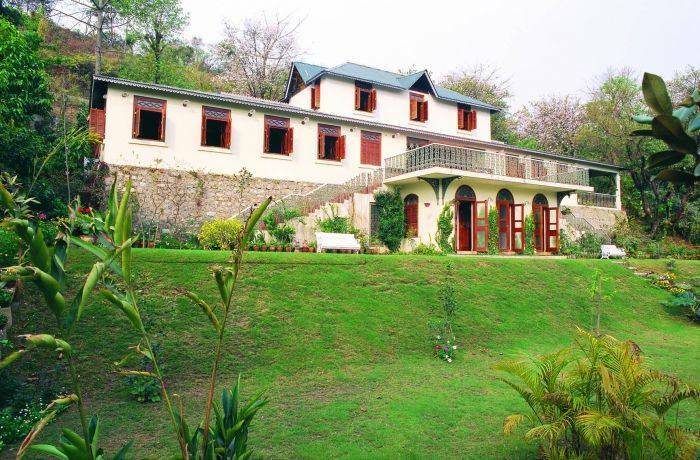 Situated just below the British hill station of Mussoorie, the elegant house, with an adjoining cottage, is located on a 7-acre estate verdant with fruit orchards, many species of exotic and rare plants and trees. The landscaped gardens, spread across five levels, are a visual delight with their watercourses, lily pools and picturesque pathways. 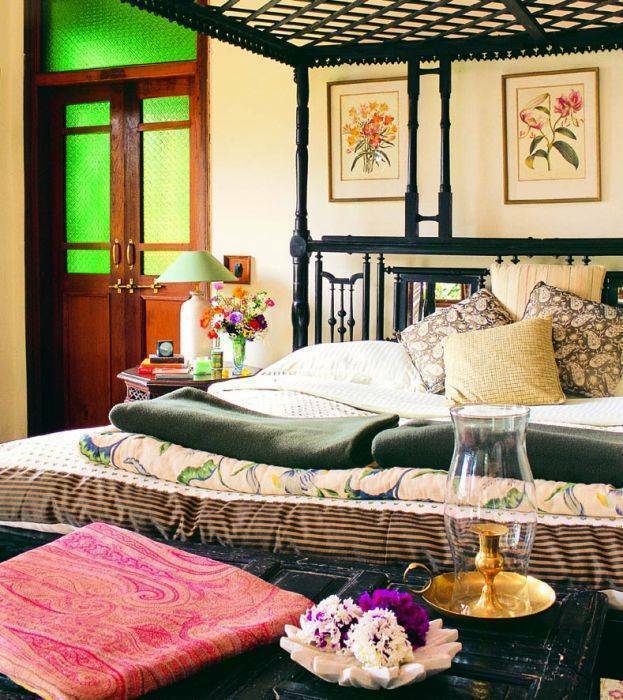 The house and the adjacent cottage are designed in the style of a colonial country bungalow with sloping roofs, decorative 'monkey tops' and wide verandahs from where one can enjoy spectacular vistas of Mussoorie and the surrounding hills. 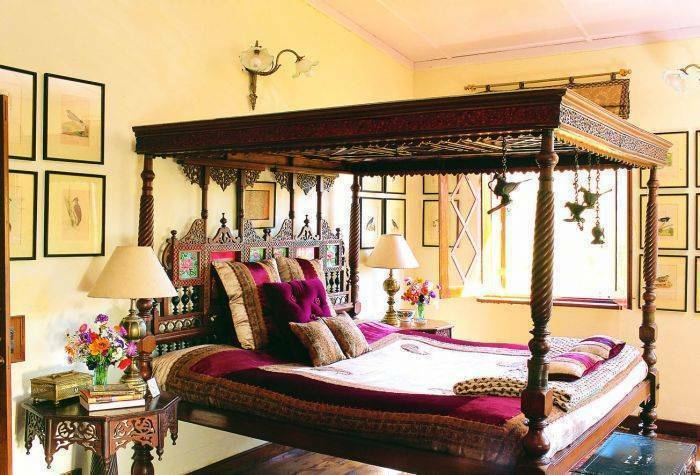 Each room is individually designed, elegantly furnished with beautifully restored period furniture, and decorated with antique fittings and rare prints of flora and fauna. All rooms offer air-conditioning in summer and heating in winter. 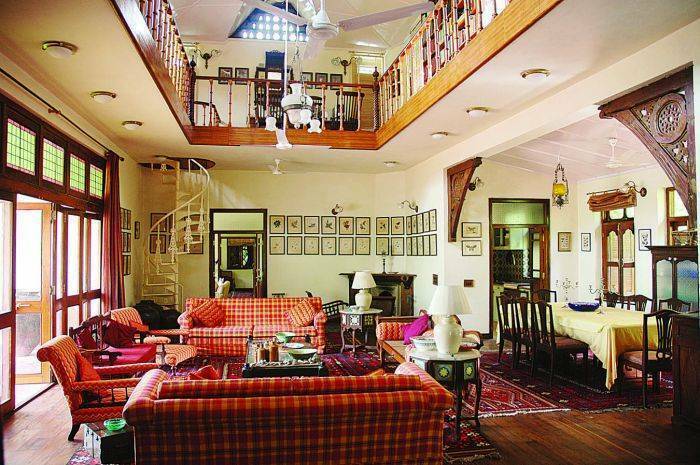 The house has appeared in several national and international magazines, periodicals and books. All the seven bedrooms have attached baths, running hot and cold water, and are equipped with modern amenities. A formal sitting and dining room is available to the visitors. A separate private sitting room completes the setting. Considered one of the best private gardens in India, it is laid out over several terraces and boasts of many rare trees and plants from all over the world. It has close to half-a-million plants and is lovingly tended by five gardeners. Benches and sitting areas are dotted over the gardens on each level and make for perfect relaxation. Seasonal flowers are planted in the thousands, both during the winter and the summer months. Over 60 varieties of fruits grow on the premises and visitors are welcome to pluck them off the trees. Like Fig, Pomegranate, Apple, Orange, Mango, Plum, Papaya, Banana, Peach, Shatut, Walnut, Keanu, Cherry, etc. The weather in this area is conducive to ‘verandah living”. The main house has a large, covered verandah with both a sitting and dining area. Breakfast, tea and lunch are served here on most days. An antique swing lulls you to a gentle sleep. Another verandah, open to the skies, with old planter’s chairs, invites you to sunbathe. The cottage, too, has a covered verandah as well as an open- air one overlooking a private garden. Shaheen Bagh is the perfect environment to learn and practice the ancient art of Yoga. The clean fresh air, the sounds of running water and chirping of birds add to the experience. Our in-house yoga guru Dr Meena Semwal give lessons between 8 and 9 every morning. These lessons come complimentary with your stay. Dr Meena Semwal is also an accomplished acupressurist. This unique infinity pool is child friendly, and is constantly refreshed with the pristine waters of the River Tons, using a time-tested and eco-friendly system called the ‘Hydram.” This avoids the use of any chlorine. The waters have been tested and found to be of pure quality. Sunbathing decks are available. More than 3500 English, Hindi & World Movies import from USA on DVD's to view in your room. A vast library above the drawing room offers many opportunities for reading during your stay. Shaheen Bagh and its surroundings are a haven for birdwatchers, visited by over 370 listed species. These include the Brown Dipper, three different forktails and the five species of sunbirds. Many of these can be seen in the walks around the house and at the river -- a 5-minute walk from the grounds. The recently discovered Nepal Wren-babbler breeds in the gardens. For the checklist see the birding section. A detailed account of birding hot spots in the area is also given. 1 Indoor games: camerboard 2. Sketching & Painting 24-hr front desk 3. Wi-Fi Internet Connection 4. Yoga & Acupressure By Dr. Meena Semwal 5. Massage 6. HDMI Connection available for your play station 7. Day trip to Dehradun/Mussorie & near by can be organised 8 9. Bonfire & Bar-B-Q. Airport pickup All inclusive plan BBQ area Bar/lounge Boat rental Breakfast included Car rental Children permitted Currency exchange Doctor on Call Express checkout Fitness equipment Gameroom Gardens Handicap access Internet access Internet wireless (free) Laundry/valet service Linen included Live music Luggage carriers Medical assistance on call Meeting facilities Movie rentals Multi-lingual staff Newspapers/magazines No curfew Open 24 Hours Parking (free) Pets not allowed Pool (outdoor) Religious group assistance Restaurant on site Room service Safe deposit box Skiing Smoking permitted Sports/activities Taxi service Tennis Tour/sightseeing assistance Voltage converters chess jhinga loto pictionary etc. The Master Suite This largest bedroom in the house is unique in many ways: it holds an exquisite traditional bed from South India, some rare ‘kilims’ from Afghanistan and a large wooden chest from Sri Lanka. The adjoining bathroom (voted ‘the best bathroom in India’ by a magazine) has a sunken bath that overlooks a private lily-pool and garden. Alfresco bathing is encouraged. The bathroom has a botanical theme with rare and original botanical prints and wall paper. Room has a LCD TV, and a DVD player HDMI Connection for your PS3 and Video Games. The Poolside Room This wonderful room is on the lower garden terrace, overlooking the pool. The interior style is done in red. It has several windows which look out on the gardens and allows the first rays of the sun to light up the room. A granite stairway leads you to the pool. Room has a LCD TV, and a DVD player HDMI Connection for your PS3 and Video Games. The Blue Room This room on the ground floor of the main house has a magnificent double bed adorned with glass paintings. The matching furniture makes this perhaps the most interesting room in the complex. Room has a LCD TV, and a DVD player HDMI Connection for your PS3 and Video Games. The Cottage Suite The upper suite in the cottages is a self-contained unit, consisting of a private verandah, a sitting room, a bedroom, a bathroom and a kitchen. It sleeps four and is ideal for a family. It has cable television and DVD facilities. The Indian Military Academy became functional from 1st October 1932 with a course strength of 40 Gentlemen Cadets. Brigadier L. P. Collins, DSO, OBE was the first Commandant. The first course had on its rolls Sam Manekshaw, Smith Dun and Mohd Musa. All of them later became the Chiefs of the armies of their respective countries namely India, Burma and Pakistan. The course was christened as 'PIONEERS'. The government acquired the estate of the erstwhile Railway College at Dehradun, which had the appropriate buildings and a fairly extensive campus to meet the requirements of the Academy at its birth. The IMA building in Dehradun is known as Chetwode Building after the name of Field Marshal Sir Philip Chetwode, who was then the Commander-in-Chief of India. IMA is located at 8 kms on Dehradun-Chakrata road and 3 kms beyond F. R. I.
Chandrabani Situated 7 Kms from Dehradun on the Dehradun-Delhi road is the famous temple of Chandrabani(Gautam Kund). According to the mythological beliefs, this spot was inhabited by Maharishi Gautam, his wife and daughter Anjani who are widely worshipped by the people. Rajaji National Park was founded in 1966 and spreads over an area of 820 the park with it’s magnificent ecosystem, is nestled in the lush valley of Shivalik ranges. It represents the flora of several zones of the forest, reverine, broad leaf mixed forest, chirpine forest, scrub land and grassy pasture lands. There are 23 species of mammals and 315 of avi-fauna here. The Rajaji National Park is named after Late Shri C. Rajgoplalachari, popularly known as Rajaji. Best Tourist season is between November to mid June. Rishikesh and Haridwar, on the banks of the Ganga, are religious sites for Hindus. The Beatles came here in search of succour in the 1970s, Hindus come here in search of salvation and to immerse the ashes of their dead, tourists from the West flock here even today on a spiritual journey, to practice yoga and meditate at the many ashrams in these holy towns. Both places are no more than an hour and a half's drive from Dehradun. Tapkeshwar Shiv Temple is an ancient place of worship and is situated on the banks of a rivulet, in the Garhi Cantt. Area, 5. 5 Kms from the city bus stand, the temple is well connected by road. It is named Tapkeshwar as water droplets, originating from a rock, fall on the Shivling placed in the shrine. People in large numbers participate in the fair organized on the occasion of Shivratri and pay their obeisance to the deity. Known as the Laxman Siddh. The foot hills of the Shivalik range. 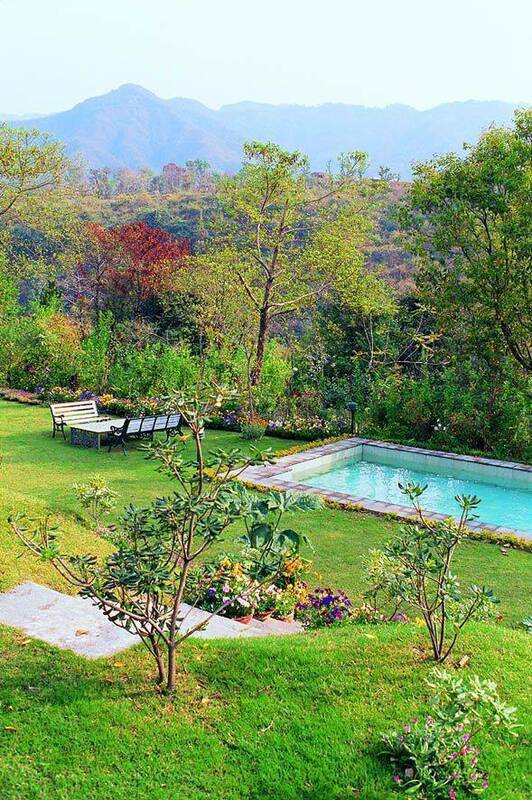 Shaheen Bagh is 20 minutes from Dehradun town, located on a hilly ridge on the town's outskirts. Shaheen bagh is 36 km. apx from Jolly Grand Airport, 13 km from railway stations, 10 km from Clock Tower. The hill station of Mussoorie is 45 minutes away. By Train: A 5½ hour train journey from New Delhi on the morning Shatabdi as well as the afternoon Jan Shatabdi. The overnight Mussoorie Express leaves Delhi at night and arrives in Dehradun the next morning. An overnight train from the Nizamuddin Station in Delhi departs late evening and arrives at dawn in Dehradun. There are also direct trains from Mumbai, Kolkata and Allahabad. By Road: A 5-hour car ride from Delhi via Roorkee or a 6-hour drive by the scenic Poanta Sahib route from Delhi. Dehradun is also connected by daily flights from the Capital. Pick-ups from the train station or the airport can be arranged on prior notice. Take Humayun's Tomb (off Ring Road) exit past Sarai Kale Khan ISBT, under the flyover, towards Noida. Road will turn right naturally. Cross bridge over railway line till you hit a T-junction at Mohan Nagar. Turn right, continue and cross Hindon River Bridge. At the first red light, turn left and this will take you on Meerut road. Continue till you cross Murad Nagar and Modi Nagar. Just short of Meerut, you will meet the Meerut bye-pass, Turn left. This road takes you past Meerut. The turning is a bit deceptive, so keep a sharp look out. If you cross a flyover, then you have missed the turning. Turn back a few hundred yards. About 16 km later you will meet the main road again at Modipuram. Keep going straight and you will come to the town of Khatauli. Just after you pass Khatauli, stop at Cheetal Grand. Don't stop at Cheetal, which is just before it. Cheetal Grand has clean toilets and good cheese omelettes. Lovely gardens. Join the road till you reach a round-about in the middle of the road, about 5 Km short of Muzzafarnagar. Turn right on the bye-pass. This is important, as Muzzafarnagar is a crowded town. About 16 km later you will hit the main road again. This too has a round-about in the middle of the road. Turn right and you will be on the Roorkee road. Pass the town of Chappar, Purkazi and Mangalaur. Just short of Roorkee you will cross a bridge over a railway track and hit a roundabout. Turn left here and you will be on the Roorkee bye-pass. Keep going after you cross a canal, pass the Gurudwara on the right. You have to turn left to Dehradun. Suggest you ask here, as it is a bit tricky. Go straight, past Bhagwanpur, till you hit Chutmulpur (about 28 km.) Turn Right at T Junction. (The left turning will take you to Saharanpur). The road takes you through Biharigarh and the Rajaji National Park. At Mohand, the ghats (small hills) start for 22 Km. At the top of the ghats there is a tunnel and on descending you will hit the cantonment of Clement Town, the outskirts of Dehradun. Keep going straight till you turn right at a T-junction. This will take you pass the railway station (on your right) till you come to a traffic light at Prince Hotel. Turn left (on Gandhi Road) and keep going till you hit another T-Junction. Bear left and go to a roundabout called Clock Tower. Turn right and you will be on Rajpur Road, Dehradun’s main road. Keep going straight for about 8 km, past Ajanta Hotel on your left and then Great Value Hotel on your right, pass the town of Jhakhan. At Krishan Pur Chungi you will see a police barrier. Turn left immediately. This is the Mussoorie diversion road. Keep going for 3 km. Pass Doon Valley Combers and Magpie Café on your left till you come to Malsi Deer park on your right. Keep going straight till you come to a left turn with Cheetal restaurant in the left corner. The road will take you to down in the valley and up again till you come to a T Junction. Turn left here. As you drive you will see a large stonewall of the Thapar Estate. Keep going for about a kilometer till you see some shops on a curve on the left of the road. This is Guniyal Gaon. Next to shops there is a cemented road going up on the right. Take it and follow it till you cross the River Tons on an iron Bridge. The road now climbs. Keep straight on it, ignoring a left turn and keep going towards Shigally School. About 3 km later you will see a green-roofed house with big gates on the right of the road. Turn into the gate and drive into the parking area.